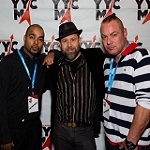 Bobby Soul interviewed at YYC Music Awards, Wins Urban Recording of the Year ! Rap star Bobby Soul appeared in an interview earlier this week, alongside fellow artists and friends Kay Layton and Chance Devlin. Bobby and Kay L were part of the four-man collab that took the win for the Urban Recording of the Year 2018 with their track Sail Away. Check out the embed below to listen to the song. Interviewed by Taylor McNallie, who is noted for her presence in the Albertan music scene interviewing various artists and hosting events and concerts, Bobby, Kay L, and Chance bantered with Taylor about the win, Chance joking that Kay L’s rhyming of Ikea with idea was the real reason they won the award. Taylor congratulated the artists and pressed them about upcoming releases, to which Chance gestured to Bobby and remarked that they were working together and producing new tracks weekly, referring to Bobby as the mastermind. The group plans to continue collaborating and producing music together, with more hits in the works. They also alluded to future releases and exclusive house shows hosted by Devlin, featuring music by each of them with a high-class setup for live music. It’s safe to expect more fantastic tracks from Bobby and the others, so keep your ear to the ground and watch his Facebook and Twitter linked below to get the latest news.